Animals migrate over long distances – but how do they know where to go? Aaron Krochmal, associate professor of biology at Washington College, discusses this question. 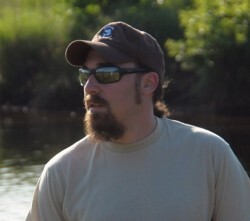 Aaron R. Krochmal, an Associate Professor of Biology at Washington College, is an integrative organismal biologist interested in the behavior, physiology, and ecology of reptiles. Specifically, he combines these disciplines to investigate how reptiles perceive, interact with, and navigate their environments. He holds a Ph.D. in Ecology and Systematics from Indiana State University. Timothy Roth is an Assistant Professor of Psychology at Franklin and Marshall College where he conducts research on the evolution of animal cognition. His specific research interests include the effect of the environment on the brain, the cognitive mechanisms of space use and navigation, and the trade-off between sleep and torpor. He earned his Ph.D. at Indiana State University. Animal migration is one of the great mysteries of the natural world. Many animals use long and complex routes to migrate to new habitat in the face of unfavorable environmental change. But how do animals know where and how to go during migration? Our work focuses on understanding the cognitive aspects of animal navigation during migration from neurological, ecological, and evolutionary perspectives. We have found that turtles that lose their habitat with the changing seasons follow intricate paths to far-off water sources and do so with remarkable precision. To see if this behavior is learned or innate, we introduced naive animals into the system and monitored their responses to habitat loss. We found that naïve juveniles under four years old learned to navigate the complex paths just as precisely as experienced local turtles, while naïve adults could not. These results suggest a narrow age window, or critical learning period, in which animals must learn to navigate. But what are the cognitive mechanisms by which these turtles actually learn to migrate? Our recent work suggests that key aspects of migration may be driven by higher-order cognitive processes previously attributed only to birds and mammals. During migration, we pharmacologically manipulated wild turtles by blocking the receptors that bind acetylcholine, a neurotransmitter associated with spatial memory. Doing so disrupted the navigation patterns of experienced adults, but had no impact on the navigation of naïve juveniles. This work demonstrates that adults use spatial memory to navigate, and that these memories are formed prior to the age of four. Together, our results suggest that successful migration in some systems hinges on spatial memory constrained by a narrow critical learning period. This work opens up the possibility that migration may be driven, at least in part, by cognitive processes in many species and raises new questions about the evolutionary origin of complex cognition.